Pour the oil into a small saucepan and briefly warm over a low heat for about 30 seconds. Add the shallot and cook for 2 minutes, remove from heat and gently stir through the tomato. Add vinegar and lime juice, and just before serving stir through the parsley. Brush each Fjord Trout pave with oil and pepper. Wrap in cling film and tie up both ends, then cook in a water bath at 60oC for 5-6 minutes. 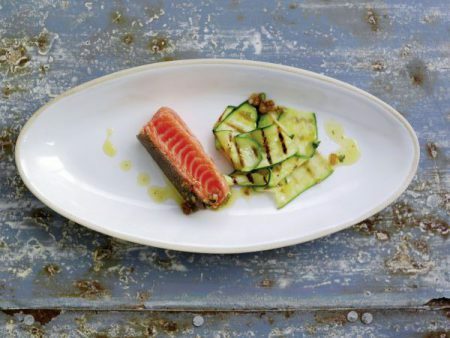 While the Fjord Trout is cooking, grill the courgette ribbons in olive oil, salt and pepper. Remove from the water bath and cut one side of the film, pat dry, brush with oil and pepper, then pan-fry on the skin only in a non-stick pan. After 2-3 minutes, when golden brown, serve pink in the middle and you will see those lovely flakes just sliding through the fork pressure. Drizzle the with the sauce vierge and serve with grilled courgettes. To this day, my favourites English red wine. Gusbourne is an estate which started in recent years to develop and become one of Englands finest winery. The Pinot noir is soft, feminine with a rounded texture. The palate offers a panel of ripe summer and berry fruits as well as a hint of spiciness. The acidity of the wine balances the richness of the mi-cuit and pairs the courgette and the balsamic and tomatoes used for the sauce vierge.